Then an author I was talking to at Archon said that although Caitlin (my agent) had turned him down as a client, she’d given him some advice that really helped him — she said that in order to count as epic fantasy, a story has to have multiple viewpoints. This was Mark Tiedemann, btw, and he recently landed THE AGENT, ie, Donald Maass. Congrats to Mark! That is a huge big deal and I bet the two manuscripts he has with that agent will get plenty of attention from publishers even if they aren’t epic fantasies. But about epic fantasy and that multiple viewpoint idea. Obviously there’s more to it than that. Like, epic fantasy novels are long, and have warfare and political maneuvering in them; we expect magic; we expect swords to be the weapons of choice though maybe guns are used around the edges a bit. Also, don’t you expect epic fantasy to have a high fantasy tone? An epic may be gritty, but it is never going to be light or humorous and it isn’t going to be sword-and-sorcery either, right? The word “epic” suggests a certain weight, a significance to the work that raises the stakes of the drama, that gives the tale it tells distinctive power and gravitas.
. . . Further, in all of the traditional epics, the narrative of events takes place on what historians call “a world historical scale.” This means that deeds of the main actors, the struggles and journeys that the epics recount, have an effect on the very nature of the world. They permanently change history. For better or worse, something is different at the end. And the author of this essay (Chloe Smith) then goes on to declare that it’s a story’s depth, rather than its breadth, that makes it an epic; and that epics don’t have to be super-long doorstops. Well. That’s a very good essay and you should certainly follow the link and read the whole thing, but as far as I’m concerned, I kind of do expect epic fantasies to be really, really long. Not necessarily George RR Martin long, but long. And how about the multiple points of view? I think that’s true — basically true — usually true — to be most precise, I think it is commercially true at this time that epic fantasy MUST have multiple points of view if you want it to sell to publishers because otherwise they won’t agree it’s epic fantasy — but I also think Marie Brennan (author of MIDNIGHT NEVER COME) offers a really useful take on how multiple POV has been handled in epic fantasy recently versus how it used to be handled and I think she totally hits the nail on the head. Her post made me sit up and go: Yeah, that’s IT. I think it is harder to become invested in a story when the narrative jumps too quickly from one pov to another; I think George RR Martin does make it easier to follow the narrative from one character to the next than many other recent epic fantasies; that has been a problem for me in reading recent epic fantasies. Even though, like Marie Brennan, I can’t really talk because I also have multiple viewpoint characters even though I’m not writing epic fantasy as such. I just finished the first two books of Daniel Abraham’s Long Price quartet — A SHADOW IN SUMMER, A BETRAYAL IN WINTER — and frankly I’m epicked out for the moment. Even though I liked both books and they grew on me more and more as I went on and I liked the characters better at the end than I had at the beginning and I really did come to care about Otah and the rest. EVEN THOUGH that is all true, I feel no immediate urge to buy the other two books or to read THE DRAGON’S PATH, which I have downstairs on my TBR pile at this very moment and which I was sort of excited to get to until I suddenly found I had met my quota for epics for the month. I’m going to go read a nice YA by Patricia Wrede (ACROSS THE GREAT BARRIER). And it’s going to have one close pov and I’m going to read the whole thing in a couple of hours and I know I will enjoy it because hey! Patricia Wrede, right? And if I ever do tackle an epic of my own? I think I will re-read that essay by Brennan first. In fact, I will probably print it out and tack it to the wall above my laptop. Because I can tell you now, I will almost certainly be aiming to do the multiple pov thing more in the old style than in the new. I don’t think there’s much chance she’ll be eating those words! Readers . . . may not be able to identify why they’re not compelled by a book. . . . . BUT. They know when a book is good enough to not only finish but recommend to their friends. Of course I totally agree! Vehemently, even! But I’m not necessarily the archetype for American readers or anything like that, because I’m pretty sure I’m way more turned off by poor writing quality than most readers. From time to time you see a discussion about which matters more: pure storytelling or quality of the writing. And most commenters declare that storytelling is primary and good writing is icing on the cake. And I sort of agree, in only in a yes-but-not-really kind of way. I’d argue that without a certain level of writing quality, the story itself just cannot be well told. At least, not in written form. Just what that certain level is . . . that’s a different question, of course! Higher than many self-published books (probably), lower than Twilight . . . in there somewhere. Ideas are thick on the ground! For me, they are in particular scattered abundantly through the pages of every book I pick up, even the books that won’t necessarily make my Top Ten List for the year. I thought it might be interesting to show how you can lift ideas from wherever and stir them briskly together to create neat ideas of your own, so here goes! This weekend, I read THE TIN PRINCESS by Philip Pullman. To be honest, I found the ending disappointing — though not quite as disappointing as an “And then she woke up” ending. (Those are the WORST.) Not that I want to put anybody off the story if they like Pullman and were thinking of looking this one up or something. The story has a lot of good things about it and it’s not like it ends up with all the main characters in a heap of bodies or anything. Now, in Pullman’s story, none of that is literally true. But what a great idea! Houses and maybe streets that shift from place to place, and maybe rain instead of mist to dissolve landmarks and etch new designs on houses and other buildings . . . it’s a GREAT idea. For a setting, of course. Now, how about a character to put in this city of shifting buildings and dissolving landmarks? I also just finished Michelle West’s HUNTER’S OATH and HUNTER’S DEATH. Not my favorite stories ever, but good, and I particularly loved the way the first book started, with a child thief being deliberately lured into trying to steal from the wrong man. Then there’s this great scene of pursuit through the city, with the man using dogs only a step removed from the Hounds of the Wild Hunt to track the thief. I really liked that! All this tension and action and yet the reader, if not the protagonist, knows all the time that the hunter is maybe a bit high-handed but not evil or anything. So it’s exciting without being scary, right? Okay, a child thief isn’t exactly a new idea, but I’ve always liked thief characters, so why not go for it? Let’s drop a child thief into our shifting city, maybe a girl instead of a boy, and have her snagged by a mysterious but powerful person for reasons of his own. (Or maybe her own?) And let’s not use dogs. Maybe hawks? Wouldn’t that be neat? Oh! Maybe little bitty miniature dragons? Not cute charming ones like Anne McCaffrey’s fire lizards, but scary little things, all sharp talons and black knife-edged scales and gleaming slit-pupilled eyes. What kind of woman might have little dragons for familiars or pets or companions or whatever? A wizard or mage? Maybe the priestess of some god? Maybe the servant of a BIG dragon somewhere? That could go in all kinds of directions depending on what we want the BIG dragon to be like. What can we do to make our child thief interesting and engaging? Don’t want her getting lost in the crowd of child thieves, right? Actually, if it were me, given this idea for the setting and the opening scene, I’d just start writing and see what happens and what kind of voice and background emerge for my thief protagonist. The world would develop around this initial setting and around the protagonist and the secondary but important woman with the little dragons — and then the plot would start to suggest itself. I mean, you probably shouldn’t have a shifting city unless the “shifting” quality of the city is going to actually be important to the plot; ditto with the BIG dragon, even if, in this first scene, it is only glimpsed in your head and not on the page. And if child thieves exist in the city, that tells you something about the society right there, doesn’t it? And there you go! See how easy that was? If I didn’t have other ideas for what I want to work on next, this would be a perfectly viable candidate. For that matter, maybe I’ll actually come back to it some time. And if somebody else “steals” it first? That’s okay, too! Lots of other ideas out there! Is a book I wish I’d written! Okay, full disclosure: I know the author. Plus the Eastern European setting, with Vlad Tepes in the background? How cool is that, right? And I happen to know that Merrie really did her research on Eastern European dragons when she was writing this book, too. I must admit, I don’t remember how to pronounce “zmeu”, even though she pronounced it for me several times. 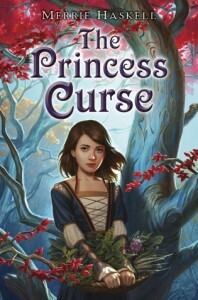 I didn’t know anything about THE PRINCESS CURSE when I ordered it, except I’d seen the cover. And I knew that Merrie had written this hilarious short story, which is the only other thing of hers I’d ever read and has a line in it that I would love to steal. The one about “having six more beautiful dark eyes” — seriously, go read the story. Well, THE PRINCESS CURSE was even better than I’d expected — I really want to quote bits, but it would be a shame if I gave away all the best lines. Plus there are a lot of great lines so it would take too long. I did laugh at the “It is a curse of shoes and naps” which everyone is quoting, but there were lots of great bits. By a startling coincidence, Thea over at The Book Smugglers posted her review just a day before I read this one myself! She does REAL reviews, not like me, so — go read that, and what she said. If you think that’s an enticing way to describe a character, any character, you’re querying the wrong agent. Ha ha ha ha ha! Okay, maybe the lab reference doesn’t strike everybody else as all that funny, but I definitely smiled. Also! This exact detail is one that I totally see when I am occasionally coaxed or browbeaten into or otherwise wind up reading some aspiring writer’s first effort at writing a novel. I’ll have to remember to ask: Wait, is this beautiful blond with the dark eyes a labrador retriever? After carefully and attentively and critically reading the World Fantasy Award nominees? Reading the two most recent Sookie Stackhouse books was just so comfortable. Good stories, good storytelling, familiar characters, plenty of action . . . just what I was in the mood for. Except doesn’t Charlaine Harris ever plan to let a romantic relationship really work out for Sookie? If you had to pick one of her romantic partners or potential romantic partners to be The One, which would it be? Personally . . . I wouldn’t mind if she really did get together permanently with Sam. So, I’ve now read five of the six World Fantasy Award nominees. I don’t get to vote, btw; I just get to listen to the panel of judges announce the winner and explain why they picked it. But I like to read the nominees anyway so I can be either outraged or pleased. Maybe I’ll go ahead and get the other one, too, just to have read the complete set. 1) Zoo City . . . not really my cup of tea. It’s a noir-ish cyperpunk-ish near future thing. I didn’t really care about the characters and the author didn’t linger on the aspects of the world that interested me most. I’d have kinda liked a different story set in that world, like about the initial appearance of the “animaled” and more about the link between crime and spirit animals and way more about the “Undertow”. But I did like the way the story worked itself out and I honestly did like the ending very much. Plus, no question, the writing is good and the world is really weird and interesting. I don’t read enough SF these days to be really get why this book stood out for readers, though. For me, not one I’ll ever re-read. 2) The Silent Land . . . I liked this a lot. I do like a horror element sometimes, especially when it’s creepy and suggestive rather than gory and splatter-punk-ish. But . . . I honestly did think it was too obvious what was going on and for me, figuring it out too early did interfere with the creepiness and suspense. 3) Redemption in Indigo . . . again, I liked this. I like the fairy tale / folk tale thing, plus I like a story with a redemption theme. I appreciated the skill with which this story was told, but for me it wasn’t too absorbing, I think because of the distance imposed by the omniscient narrator. 5) The Hundred Thousand Kingdoms, which is probably the best book I’ve read this year. Wonderful style, great characters, absorbing story; yes, okay, you do know sort of what’s coming at the end but seeing how it happens is still gripping. Loved it! Sequel’s just as good! I personally thought it was so good it went right off the top of the scale. Obviously, it’s got my vote. Now just waiting to see what the judges think . . .
I’m a big Wrede fan. Just got another one of her books — it’s on my TBR pile. If she’d said all this stuff about how she does detailed character sketches before she writes and notes down details about their backstories etc etc . . . I wouldn’t have believed her, I guess. I still do most of my characterization by instinct – that is, I don’t get this analytical when I’m actually writing a scene. As I said, for me, it’s more like method acting – trying to be the character for an instant or two, long enough to figure out what to describe. Which is what we’d expect, right? And she’s totally right that she has a knack for dialogue and that can carry a lot of the characterization . . . Amberglas in THE SEVEN TOWERS? That was some of the funniest, most effective dialogue EVER and instantly hooked me on Wrede. I haven’t missed one of her books since. So, if ending a book is, as Barbara Hambly says, like coaxing a dragon to land on the point of a pencil, what’s a good metaphor for beginnings? But difficult or not, the beginning is definitely crucial. Raise your hand if you read the first page of a book before you buy it! At least if you’re in a bookstore with the book actually in your reach. Any hands not go up? Right. Morning light the sulphur colour of the mine dumps seeps across Johannesburg’s skyline and sears thorugh my window. My own personal bat signal. Or a reminder that I really need to get curtains. Shielding my eyes — morning has broken and there’s no picking up the pieces — I yank back the sheet and peel out of bed. Benoit doesn’t so much as stir, with only his calloused feet sticing out from under the duvet like knots of driftwood. feet like that, they tell a story. They say he walked all the way from Kinshasa with his Mongoose strapped to his chest. The Mongoose in question is curled up like a furry comma on my laptop, the glow of the LED throbing under his nose. Like he doesn’t know that my computer is out of bounds. Let’s just say I’m precious about my work. Let’s just say it’s not entirely legal. Okay, how about that? We get a vivid use of language and imagery, a noir feel, a clear indication of the setting — Johannesburg, maybe near future. Immediately we wonder why ‘Mongoose’ is capitalized. And there’s the intriguing question of what kind of work the narrator does that isn’t entirely legal. Even though I read a lot more fantasy than SF and even though a noir cyberpunky kind of feel isn’t necessarily my favorite, I’d turn the page. A rival of mine once complained that my stories begin awkwardly and end untidily. I am willing to admit to many faults, but I will not burden my conscience with that one. All my tales are true, drawn from life, and a life story is not a tidy thing. It is a half-tamed horse that you seize on the run and ride with knees and teeth clenched, and then you regretfully slip off as gently and safely as you can, always wondering if you could have gone a few metres more. Thus I seize this tale, starting with a hot afternoon in the town of Erria, a dusty side street near the financial quarter. But I will make one concession to tradition . . .
. . . Once upon a time — but whether a time that was, or a time that is, or a time that is to come, I may not tell — there was a man, a tracker by occupation, called Kwame. He had been born in a certain country in a certain year when history had reached that grey twilight in which fables of true love, the power of princes, and deeds of honour are told only to children. He regretted this oversight on the part of Fate, but he managed to curb his restless imagination and do the daily work that brought in the daily bread. Today’s work will test his self-restraint. Quite a different tone, isn’t it? A narrator, but this time omniscient and outside the action, totally different from the close first-person pov in the first example. This is the one that starts off with a Senegalese folk tale and goes on from there. And, of course, it sounds exactly like a folk tale — or like a story which is going to start with a folk tale. I really like that first sentence. And how do you like that bit about history reaching a grey twilight? Nice, huh? If there are a few moments in life that come as clear and as pure as ice, when the mountain breathed back at her Zoe knew she had trapped one such moment and it could never be taken away. Everywhere was snow and silence. Snow and silence; the complete arrest of life; a rehearsal for and a pre-echo of death. But her breath was warm and it said no to any premature thought of death. She pointed her skis down the hill. The tips of her skis looked like weird talons of brilliant red and gold in the powder snow as she waited, ready to swoop. I am alive. I am an eagle. Fantasy grades into horror on the far side, right? All that about life and death, does that signal that this story is really horror, or did I just get that idea from the jacket copy and the (very artistic) cover? Actually, it’s simplistic to say that this novel is horror; it sort of is, and sort of isn’t. The language is very clean and creates a very clear scene, doesn’t it? Did you notice that the second sentence is a fragment? That contributes to the sense of stillness the author is creating in this opening scene. I read the first few paragraphs here and immediately feel like I can relax into the story — I trust the author’s skill, though I’m nervous about what he might do to his protagonist. And isn’t it interesting that we might have chosen these three books to exemplify point-of-view options? Limited first person, omniscient first person, close third person. I didn’t even notice that until now. Okay, onward! Amid the ten thousand noises and the jade-and-gold and the whirling dust of Xinan, he had often stayed awake all night among friends, drinking spiced wine in the North District with the courtesans. They would listen to flute or pipa music and declaim poetry, test each other with jibes and quotes, sometimes find a private room with a scented, silken woman, before weaving unsteadily home after the dawn drums sounded curfew’s end, to sleep away the day instead of studying. Here in the mountains, alone in hard, clear air by the waters of Kuala Nor, far to the west of the imperial city, beyond the borders of the empire, even, Tai was in a narrow bed by darkfall, under the first brilliant stars, and awake at sunrise. In spring and summer the birds woke him. This was a place where thousands upon thousands nested noisily: fishhawks and cormorants, wild geese and cranes. The geese made him think of friends far away. Wild geese were a symbol of absence: in poetry, in life. Cranes were fidelity, another matter. In winter the cold was savage, it could take the breath away. The north wind when it blew was an assault, outdoors, and even through the cabin walls. He slept under layers of fur and sheepskin, and no birds woke him at dawn from the icebound nesting grounds on the far side of the lake. The ghosts were outside in all seasons, moonlit nights and dark, as soon as the sun went down. Okay, I read once that you should be wary of letting any sentence stand by itself in a paragraph. I started paying attention after that and I think that’s basically true. But it sure isn’t a universal rule. I didn’t realize until now that Kay wrote his first three paragraphs as one sentence each. How ’bout that? Kay writes beautiful prose and this is certainly a good example of that, isn’t it? Lovely prose, and we instantly know so much about the setting and the protagonist. And then there’s the thing about the ghosts. Even if I didn’t already love Kay’s writing, I’d be hooked. My mother was an heiress of the Arameri. There was a ball for the lesser nobility — the sort of thing that happens once a decade as a backhanded sop to their self-esteem. My father dared ask my mother to dance; she deigned to consent. I have often wondered what he said and did that night to make her fall in love with him so powerfully, for she eventually abdicated her position to be with him. It is the stuff of great tales, yes? Very romantic. In the tales, such a couple lives happily ever after. The tales do not say what happens when the most powerful family in the world is offended in the process. Oookay. so much going on here, it’s hard to know where to start. Can you think of another opening where the reader is challenged so immediately and directly with such big questions? And that fairy-tale feel in the third paragraph, that’s intriguing, too; it catches me immediately. I’ve read (somewhere, don’t ask me where, I don’t remember) a review of this book which basically said, It’s a nice fantasy, but nothing new or striking. I totally disagree. I think this narrative voice is really unusual and striking, I think that comes through right from this very powerful beginning, and I think Jemisin did an amazing job with this book (and its sequel, btw). In fact, let me just add here, I nominated this one for every possible award and voted for it where I could, I was glad to see it on the ballot for the Nebula and Hugo, and I think it deserves to win the World Fantasy Award — though I’m not quite through reading Zoo City, but I don’t think I’ll change my mind! First, though you hear a lot about first sentences, I’d say it’s clear you have several paragraphs to grab the reader. I’d say one of these, maybe two, have boring first sentences, but that’s not relevant because the first sentence doesn’t stand alone. Do you have to start with action? You hear that a lot: you have to start in the middle of action. I’d say that’s clearly an overstatement at best and maybe just wrong. At Archon last week I participated in the writer’s workshops and one of my workshops was on beginnings, and I said that at least in fantasy, you often start with the setting, not with action — but the setting is not objective; it is seen from your protagonist’s perspective. Well, I rest my case. The truth is, you have to start with something that will make your reader want to turn the page. That may mean you open your book by dropping your protagonist off a cliff, but obviously it doesn’t have to mean that at all. Though it’s true that someplace in the first few pages you usually show how your main character has reached a turning point where his life is going to change forever. But I don’t think even that is always true. And, last, about point of view? Write it how you want to or how it wants to be written. I expect I’ll maintain till my dying day that a limited third person pov is easier and more straightforward than any other option, but hey! These books could constitute a workshop in different ways to handle pov. It’s books like these that make me maintain that you learn to write by reading. That I noticed on Barbara Hambly’s livejournal. Don’t you love that? Like a dragon landing on the point of a pencil. What an image! That’s especially apropos because, as you may remember, I specifically mentioned just the other day how much I liked the ending lines from Hambly’s most recent Benjamen January novel, THE SHIRT OFF HIS BACK. My vote for best ever is the ending line from Patricia McKillip’s THE BOOK OF ATRIX WOLFE.